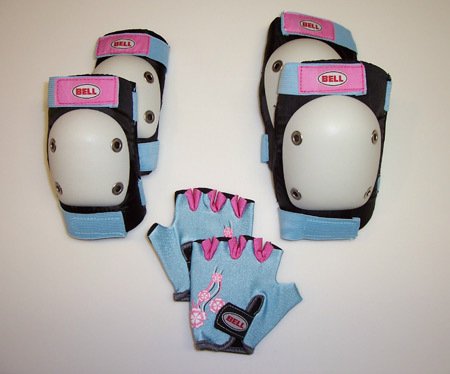 Our GIRL'S PAD SET, manufactured by BELL features (2) Elbow Pads, (2) Knee Pads, and (2) Hand Pads. The Elbow and Knee Pads have a soft inside with a plastic shell on the outside and feature easy to use Velcro Straps that are fully adjustable. They are black, with a white colored shell, and light blue straps. The Hand Pads have a Velcro Strap that is fully adjustable and on the palm side there is a sewn in pad. The Hand Pads are light blue and pink with a flower print on the back of the hand. They can be cleaned by hand. Made extremely well and sized for TODDLERS.